the thrill of it all - moments of joy in the wedding chaos: The wedding rings - Immerse, Yarra Valley. 'Ring shots are weird!' Yes, oh yes, they are, not as weird as record players and picnic rugs, or gelato on faces, but weird nonetheless - rings belong on fingers don't they? Having said that, I get some pleasure out of finding odd places to photograph wedding rings, it's my little moment of quiet, just me and the rings, time out with something that doesn't talk or blink, and I give them names - these are Gino, Lino and Pino. 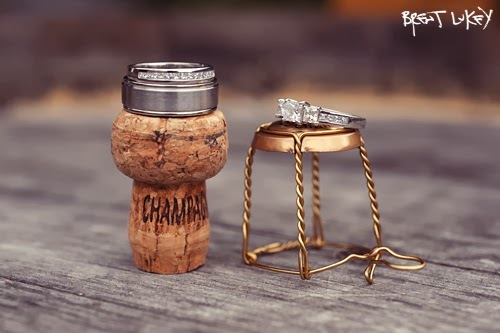 This is Saturday's shot using the champagne cork I pocketed at the bride's house - yes it's weird. Cheers.